Buses are an excellent source of transportation in and around Florida and offer an affordable method to get around the state, as well as shuttle between various points of interest. Buses are also integral in the school system and shuttle children to and from school every day. Unfortunately, buses do not come equipped with as many safety features as modern motor vehicles are now required to contain. For example, public transportation buses are not required to have seatbelts and do not offer the protection of airbags in an accident. As a result, many people are often injured during bus accidents. If you or somebody you love was seriously harmed in a bus accident, reach out to a knowledgeable Miami bus accident attorney as soon as you are able to after your injuries so that you can begin the healing process, both emotionally and physically. Bus accidents accounted for 34,000 of the total car accident injuries in 2014 throughout the state of Florida, including both drivers and passengers. Out of this number, three injuries led to fatalities. Passengers represented the bulk of the injuries, as bus drivers often have more safety features readily available to them. Bus accidents are rarely the fault of the bus driver, although the severity of the injuries are due to the failure of bus companies to adequately implement the correct safety devices throughout the vehicle. A passenger in a bus is likely to be thrown through the bus, or even outside of the bus during even a small impact accident due to the lack of safety features, whereas the motor vehicle which collides with the bus will often not have as many injuries. This represents a frightening statistic, considering the size of a typical motor vehicle compared to the size of a typical bus. It is more devastating when we consider the fact that our children routinely take the bus to and from school, or during school on field trips. A victim in a bus accident often has several sources of recovery options: the individual bus driver, the other vehicle driver, and the bus company. Bus companies often have large insurance policies to cover accidents and the resulting injuries. The insurance company will often try to coerce a settlement with the victims of the accident. However, it is important to refrain from accepting a settlement before you speak with a personal injury attorney in Miami, FL. Settlement options may seem attractive, especially given the quick payment turnaround, but it is important to take into consideration all the factors of your damages. A typical insurance settlement will not project expenses into the future, and will instead only focus on the current claim amounts, such as medical expenses and a brief compensation for the injury itself. However, this will not factor in the physical and emotional devastation caused by the accident, which makes hiring an accomplished Miami bus accident attorney all the more necessary. 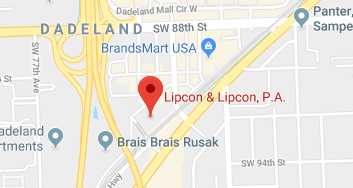 If you or a loved one have been injured in a bus accident, do not hesitate to contact the attorneys of Lipcon & Lipcon, P.A. Our bus accident attorneys have years of experience in providing our clients with the advice necessary to file a claim for damages and receive the compensation they deserve for their injuries. Buses are dangerous vehicles during any accident and can lead to lifelong injuries or even death for passengers. Contact us today for your initial free legal consultation.